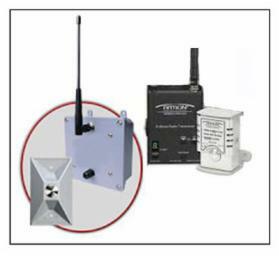 Falcon Direct is pleased to announce our second generation of wireless door announcement and wireless intercom systems. DoorCall 1 is a push button activated wireless paging system first used by the Argo Alabama Fire Department to allow visitors to make their presence known. When the call button is pushed, a tone page alert is transmitted directly to the fire pagers worn by department members on and around the premises or optionally to a receiver connected to the building PA system. Following an alert tone, all users hear the message - Visitor at door. The DoorCall 1 replaced an existing intercom system that didn't work out since it required personnel to be at a fixed location to hear the intercom. Now they can be anywhere on the premises! Priced at just $495, DoorCall 1 is easily installed by most users. DoorCall 2 has 2-way capability. The visitor can actually speak to a person inside the building and they can speak to the visitor. This unit provides capabilities similar to a traditional wireless call box, but at much less cost - $595 to be specific. DoorCall 2 is ideal for a variety of applications including apartment managers, church offices, day care centers, and fire stations. Additional information is available by clicking here or by calling 205.854.2611, or dropping us an email to ServingU@falcondirect.com.